Having recently been given an opportunity to personally explore a stunning piece of handcrafted jewelry from a NOVICA artist, I cannot help but to share. Finding something fabulous from the NOVICA collections is certainly not a challenging task, rather, the challenge lies in being able to choose from among all the delightful offerings. Whether you seek a special gift, an item to adorn your home or yourself, I recommend allowing for ample time to lose yourself among the stunning pieces you'll discover. As the Teen Diva and I have been busy preparing for her first full formal event, I sought to find a special piece to compliment the gorgeous gown she selected. Although we could have easily selected jewelry from the dress shop or at the mall, now that she is the ripe old age of sixteen, she is ready to begin collecting pieces that hold more meaning than the generic finds at every store. NOVICA's collection of handcrafted jewelry proved an excellent resource to find a piece suitable for her special evening, as well as to promote thoughtfulness in her shopping selections. My search led me to the delicate creations of NOVICA artist, Hema. I was always enchanted by the unique and endless beauty of Indian handicrafts. From the ancient beauty of Mughal art, the exotic crafts from the hills or the traditional art of central India, it is always fascinating. My family also has a long lineage of silver crafting. I learned the art from my father. He is a wonderful artist and does his work with great grace and detail. 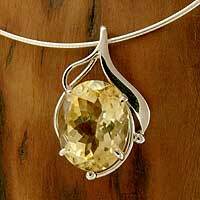 We use silver and gemstones to create our designs. Our designs are contemporary but they match the taste of old and young alike. I am always excited to see something new and, when people appreciate our effort, it gives me even more joy. To compliment her dress in blue, I found it easy to discover a wealth of possibilities, using NOVICA's easy to navigate site and became instantly enchanted by the pieces found in the Silver Pendant Necklace collection. I found an elegant pendant in sterling silver, gracefully showcasing a blue topaz gemstone from within, Hema's works, Blue Comet. Just the right touch to compliment the Teen Diva's gown. I appreciated that my selection was delivered safely, in a stylish and colorful gift box, including an enclosure, highlighting a bit about both the artist and the piece. 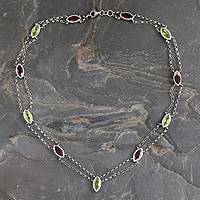 Whatever occasion has you on the hunt for the perfect, unique gift or if you are quite overdue for a treat for yourself, I can assure you that you'll find wonderful pieces through NOVICA. 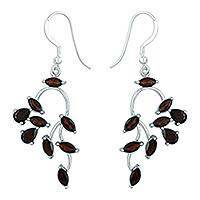 From adornments, like Silver Cocktail Rings for Mom, Amber Earrings for yourself to apparel, like cozy handcrafted Cardigans for Dad, open the door to a world of wonder, style and quality from NOVICA. Can't get enough or desire to explore in depth? I was provided with a stunning piece from NOVICA for the purposes of creating this feature. The opinions above are both honest and of my own experience. Some images and information sourced from various NOVICA sites. I love the handcrafted Novica pieces. They are lovely and a true work of art. They do have some truly unique pieces. I love how unique each piece is...stunning!